Coral Champagne produces export quality firm fruit that are large to very large in size. The selection ripens just after Chelan, approximately 10 days before Bing and is sweet in flavor with low acidity. 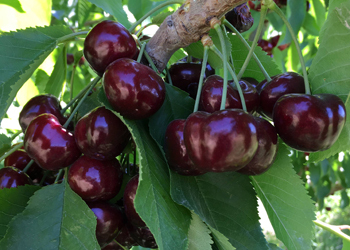 Cherries are pinkish red with a glossy dark flesh at the time of harvest. Coral Champagne’s cracking sensitivity is similar to Bing. Pollen Group III (S3S4).